The author joined the 1 Service Battalion in Calgary in the summer of 1978, as a private fresh from trades training in Borden. Sometime later that year the Commanding Officer decided he wanted a unit drum and bugle band and the call for volunteers went out. A Band Sergeant was brought in to train and conduct the band. During the winter/spring of 1978/79 we practiced twice a week in a little shack down the hill in Sarcee, Alberta. I remember that it wasn’t normally heated until we used it and we would practice in our parkas. By the summer we were starting to sound like a band. 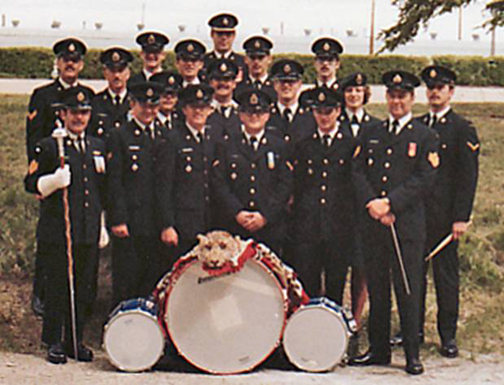 The 1 Service Battalion band. This unauthorised band is shown at Wainwright, Alberta, June 1979. In June 1979, while on concentration at CFB Wainwright (WAINCON 79) we brought our instruments and dress uniforms to the field. We practiced band drill and playing while marching on the parade square in Camp Wainwright. It also gave us a chance to get a break from the field and enjoy a shower. Cap and collar badges of the 1 Service battalion band. Courtesy the author from a display he mounted in 1982. At this time the band consisted of the Band Sgt (conductor), a Band Administration Officer, a Drum Major (Sgt), four snare drummers, two side drummers, a bass drummer, three glockenspiel players, three buglers, and two baritone buglers (which included the author). During Waincon there was a female augmentee from the Canadian Scottish Regiment playing the glockenspiel. In the spring of 1979 each band member was issued with a cap badge and pair of collars. 50 sets of these were purchased using unit funds. The cap badge is a very nice looking metal and enamel representation of the 1st Service Battalion crest. It measures 2 inches high by 1- 5/16 inches wide. It has a beret slider that is quite deep at 5/16 inches. A gold coloured crown inlaid with enamel – white upper, red middle and white on the bottom – surmounting the crest. Surrounded by ten gold maple leaves is an upright oval consisting of the gold and white ram’s head of 1 Canadian Mechanised Brigade Group on the diagonal colours of the Service Battalions (blue over yellow over red). 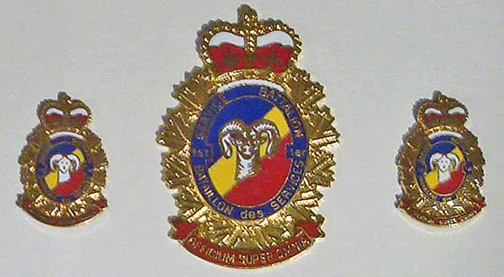 This is enclosed by a blue border with the gold words: 1 SERVICE BATTALION – 1 BATAILLON des SERVICES. The bottom consists of a red banner with the gold motto: OFFICIUM SUPER OMNIA. The back is a gold-coloured, fine lined cross pattern. At about 5/16 inches from the bottom, under the beret slider, is the makers’ name, NORMANDY. Our first command performance at which we wore the 1 Service Battalion Band cap badge and collars was (if I remember correctly) for the Battalion Change of Command Parade shortly after we returned from Wainwright. While there were a couple more performances the band died a quiet death through postings and a lack of interest from the new CO. When I left the battalion in the summer of 1981 all that was left was a single piper who played at battalion mess functions and parades. The piper wore the battalion band cap badge on his Glengarry. The collars are the same design and colours but half size. The ram’s head is less detailed and has more white in it. The back has two vertically mounted clutch pin fasteners. There is no name on the back of these collar badges. As a point of interest the collar badge is the same as the one used on the 1 Service Battalion belt buckle as they all came from the same supplier. I like the story but there is a major irregularity……The name of the unit is “1” Service Battalion not “First” Service Battalion. Thanks Sandy. I have corrected this. I was with 1 Svc Bn from Nov 78 to Feb 81. You must have kept very quiet, because I don’t remember anything about a Bn Band at all. I was Supply Company, Non-Tech Shop.